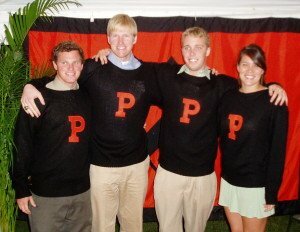 The Princeton Varsity Club provides letter sweaters to graduating student-athletes who are members of a varsity athletic team and appear on that team’s active/injured roster at time of graduation. All sweaters are presented at the culmination of the Princeton Varsity Club Awards Banquet on the Thursday preceding Commencement. The sweaters are exclusive 100% knit black wool sweaters with the 6″ Princeton P sewn on the front. The Princeton Varsity Club is pleased to offer Princeton athletic alumni (having earned at least one varsity letter) the opportunity to purchase a replacement letter sweater. For more information about our replacement program please click here.